In this last of our bible studies on the tabernacle, we will depart from our examination of its furniture, and we will focus our attention on the High Priest, who ministered within the tabernacle. • Ex 28:1. Q. Who were to become the priests in the Tabernacle? • Ex 28:3. Q. What was the purpose of Aaron’s unique garments? • Ex 28:4. Q. What were some of the garments that were to be made for Aaron? • Ex 29:9. Q. Aaron was the first high priest, who would come after him? God called Aaron to be the high priest and his sons to minister with him. Some of the duties of the high priest included offering sacrifices, lighting the lamps, consecrating the priests, and making atonement in the most holy place once a year. 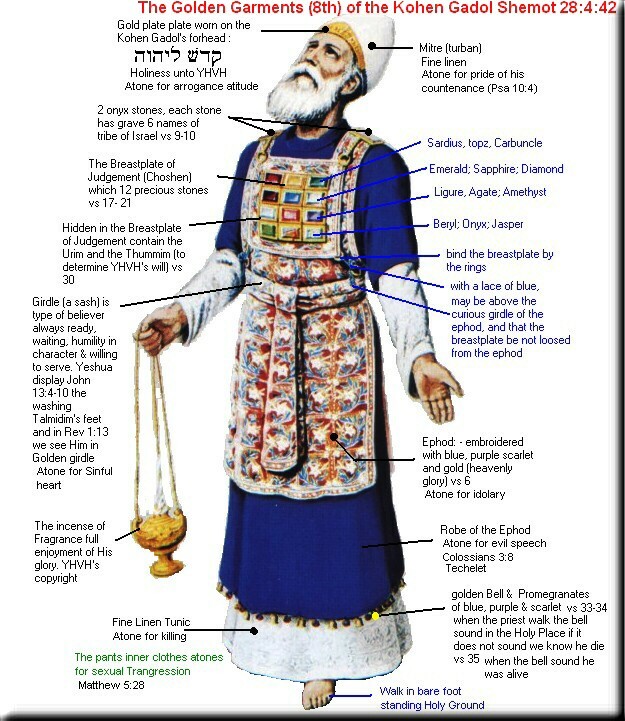 He bore the names of the twelve tribes both on his chest and on his shoulders, thus symbolizing that he was mediating on behalf of all of Israel (Ex 28:12, 29). The overarching purpose of the high priest was to atone for the sins of the people by offering gifts and sacrifices (Heb 5:1). He ministered for the purpose of bringing the people to God. He was, in essence, bridging the gap between God and man. • Heb 3:1. Q. What two titles are given to Jesus in this verse? • Heb 4:14. Q. Who is our High Priest? The writer of Hebrews not only states that Jesus is our high priest, but argues that he is, in all ways, a superior high priest. Let’s consider some of the arguments that God uses to teach us this truth. • Heb 7:26. Q. In what five ways is Jesus described here? • Heb 7:27. Q. What did Jesus not have to do before offering a sacrifice for the sins of the people? • Heb 4:15. Q. What does this verse indicate about Jesus and sin? Jesus is unlike the priests of the Old Testament because he is sinless. There has never been a need for Jesus to offer sacrifice for his own sin, but only for the sins of the world. His sinlessness was essential in order to make the offering of himself acceptable in the sight of God (1 Pet 1:18,19; 1John 3:5). • Heb 10:10. Q. What was offered for us? For how long is this effective? • Heb 10:12. Q. How many times has Christ offered himself for our sins? • Heb 10:14. Q. What has he done by this one offering? • Heb 10:17. Q. What will God not do with our sins? • Heb 10:18. Q. What no longer has to be done, since Jesus has given himself for the remission of our sins? • Heb 10:19. Q. What are we able to do since Jesus offered his blood for our sins? • Heb 10:22. Q. What are we encouraged to do in this verse? Q. Why are we able to do this? Remember, the high priest of the Old Testament had the primary role of bringing God and His people together. The priest attempted to reconcile the holy God of Heaven with sinful men, and he failed. As long as the old system existed, God and man were separated. This changed with the sacrifice of Christ, now all believers are encouraged to “draw nigh to God”! • Heb 10:23 Q. How are we now able to hold fast the profession of our faith? The sacrifice of Jesus Christ is far superior to the goats and bulls of the Old Testament. We can have an unwavering faith, we can draw close to Him and we can do it with boldness. This is all the result of Christ’s superior sacrifice. Unlike the high priest of the Old Testament, Jesus offered a sacrifice which could actually take away sin and not simply cover it. The offering of this superior sacrifice has meant that the entire sacrificial system of the Old Testament could be done away with. The book of Hebrews was written to convince Jews of that day that they could turn completely from the sacrificial system of Judaism and embrace Christ. It only made sense that they would do this, for in actuality, the sacrifices in the temple had been rendered meaningless by the death and resurrection of Christ. He fulfilled the sacrificial law of the Old Testament and by doing so rendered it obsolete (Heb 8:12,13). • Heb 4:15. Q. What can Jesus be “touched with”? Q. Why is he able to be touched with our infirmities? • Heb 2:18. Q. What has Jesus’ incarnation, and his temptation in the flesh enabled him to do for us? Jesus is a superior high priest because he suffered as a man on earth. He faced all the temptations that we face but gave into none of them (Heb 4:15, 1 John 2:16). His incarnation and temptation means that he understands everything that we face here on earth, the fact that he was victorious over all temptation means that he is also able to help us in our times of need. This ability sets him apart from any earthly priest. As the son of God, Jesus knows all things. His incarnation and temptation was not so much a learning experience for Him as it was for us. God wanted us to understand that He understands. When we face temptation or trials we can be assured that we have a High Priest that empathizes with us. He shows compassion on us because he also has been subject to the temptations and trials that we face. _ Discuss the difference between empathy and sympathy. • Heb 4:16. Q. Because Jesus has this superior ability, what can we do when we find ourselves in a time of need? _ How is “coming boldly unto the throne of grace” practically applied? • Heb 5:5 So also Christ glorified not himself to be made an high priest; but he that said unto him, ______________________________, to day have I begotten thee. The priests which ministered in the tabernacle were all descendants of Levi and Aaron. They became priests simply by inheritance. They were not selected by God or chosen due to any particular abilities. A father would pass off the scene and his son would take up his office. They were priests according to the law (Heb 7:28). This is not so when it comes to the priesthood of Jesus. He was not of the tribe of Levi, but of Judah (Heb 7:14), and according to Heb 7:28, he was not made a priest according to the law, but by the word of an oath. What was this oath? • Psalm 110:4. What order of priests would Jesus be a part of? We do not have space to study in detail this man named Melchizedek. Suffice it to say that he was not of the tribe of Levi, but was the priest of the most high God long before the law was instituted (Gen 14:18-20). The existence of this priesthood (of which only Melchizedek and Jesus were part of), indicates that God never intended for the Levitical priesthood to continue forever. Jesus is a priest, not by the law, but by God’s choice. He is not a priest within the Levitical system, but outside of it. This has enabled him to be a priest not just for Israel, but for the whole world. • Heb 12:2. Q. Where is Jesus now? • Heb 7:25. Q. What does he ever live to do for us? Jesus has an eternal priesthood. He became a man, lived a sinless life, and died for our sins, so that he could become our mediator in heaven. As the son of God, we know he is always at the right hand of the Father As our superior priest he stands as our advocate (1John 2:1). He intercedes for us continually and pleads our case before the Father. Through Him, we can come boldly to God. We can have peace knowing that he understands our hurts and is both willing and able to help us in our times of need. Because of his perfect sacrifice we can have an unwavering faith. He is in all ways, a superior high priest.